Monitor – Monitors step count, distance travelled and calories burned, allowing you to set specific targets and revel in satisfaction as they tumble. Flip-top Case Design – Protects the large, digital display when not in use. Belt Clip – Enables the wearer to clip the device onto a waistband or belt. Durable, Lightweight Resin Case – Offers durable, effective resistance against abrasions and knocks. 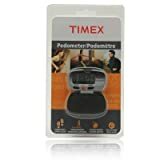 Presented in a lightweight, durable, resin case, the Timex Pedometer monitors your step count, distance travelled and calories burned over that time. This device allows you to set specific targets and revel in satisfaction as they tumble. A flip top hides the large digital display to protect it from damage when not in use or clipped onto your belt.